Astra Village (Kefalonia) is situated in western Greece on the Cephalonia Island. It is a marvellous sea side land scape, where you can enjoy natural beauty and innumerable historical attractions. The hotel has a wealth of rooms in numerous categories that will enable solo travellers, couples, families and group of friends something suitable. There are numerous things to do in the hotel that include indoor activities such as billiards, fitness room, water aerobics and much more. Those who want to get themselves pampered can step into the fully-fledged spa center. Other than this, there is a marvellous outdoor swimming pool, where you can take a relaxing swim under the balmy sun. 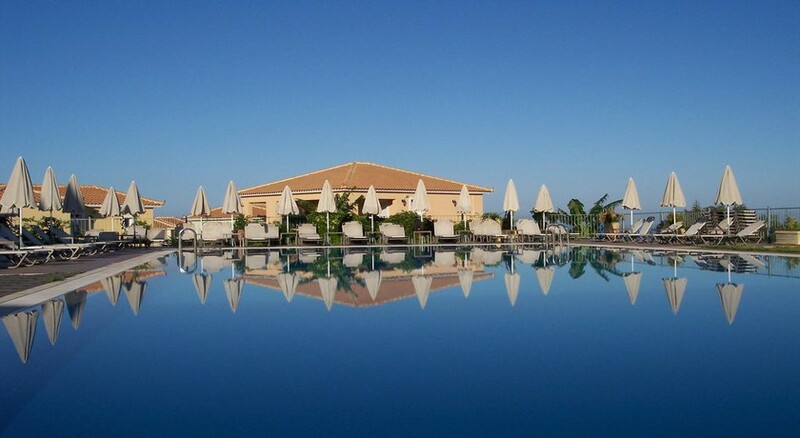 Astra Village (Kefalonia) is ideally situated in Livathou on the Cephalonia Island. The Sami Harbour is 35.3km from the resort, which is not too far. The Cephalonia Airport is about 3km from the resort, making it convenient for the guests to board their flights on time. Other than this, there are numerous shopping malls, restaurants, bars and night clubs close to the hotel. The rooms in the hotel are absolutely stunning, perfect for a memorable holiday. The rooms are available in numerous categories that include exclusive, guest room, deluxe guest room, junior suite and prestige suite. Take a look at the common facilities in the rooms: twin or King size beds, orthopaedic mattress, working desk, sofa, coffee & tea making facilities, mini Fridge, safe, temperature-controlled air conditioner, 32'' flat screen TV, complimentary Wi-Fi, telephone, cotton bathrobes and slippers and selective branded amenities, shower or bathtub, magnifying mirror, hairdryer, smoke detector and balcony or terrace. The hotel features an exceptional restaurant, a bar, a pool bar and wine cellar. The restaurant and bar serve a wide variety of cuisines from around the world. The hotel offers in-room dining service. There are a host of sport, leisure and entertainment experiences to be had both in and around the Astra Village (Kefalonia). There is an outdoor swimming pool, where guests can take a refreshing swim and relax on the sun lounger dotted across the pool. There are a range of indoor activities too, including Jacuzzi, billiards & table soccer, water aerobics, fitness room, sauna-hammam, spa center and wine tasting on site. In addition to these, there is a well-equipped fitness centre, where guests can maintain their fitness level. When parents are engaged in the pool or the gym, children can go to the playground with climbing walls, slides and swings. We stayed at Astra Village Hotel for 10 days. The room was everything that we were told it would be. Modern, very good facilities, air conditioning worked well and the room was cleaned daily. All hotel staff were helpful and always cheerful. It was a lovely holiday.